We have been producing blank and custom pennants for many years, and this experience enables us to create the perfect pennant for you. Our customers have been using us to create custom pennants and high-quality merchandise for some time; we are experts in producing professionally finished pennants at affordable prices! We take your personal designs and specifications and turn them into high quality personalised pennants that are fit for any occasion. We appreciate that quality, price and delivery are important to our customers, whether you are ordering one custom pennant or a thousand pennant flags. We take great care in understanding exactly what your expectations are – after all, the better we understand your requirements, the easier it is for us to exceed them! 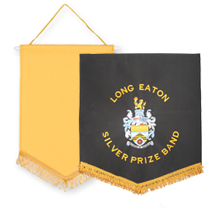 We manufacture sports pennants and flags for a wide variety of clubs, including football clubs, school sports clubs, and various member societies. We have produced football flags and football pennants for everyone from local clubs to clubs at the top flight of European leagues. Our sports pennants stand the test of time and act as the perfect memento for all occasions! The materials we use to create your pennant or pennant flag will be selected by you. How long will my personalised pennant last? 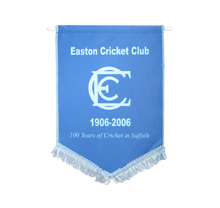 Our pennants are made to stand the test of time and last for significant periods of time. We see them in bars and clubs all over the world. With years of experience making pennants, you know you are in the safest hands! How should I display my custom pennant? All of our pennants come with a hanging cord, making them simple to hang. Is there a maximum size for Golden Finishes’ custom pennants? We can make your pennant to virtually any size. Speak to our Customer Service Team to discuss this – we are happy to create bespoke items of all shapes and sizes for your special occasion. For quality pennants and flags from a specialist supplier with over 30 years of industry experience, call 02920 755733 or email info@goldenfinishes.com today.